I’ve always loved the immersion of fictional worlds, whether I’m reading great books or seeing imaginary stories being brought to life on screen. This is why I’m still working on Allfield-an idea I’ve been kicking around since I was tiny. And a music soundtrack is a large component of stirring the imagination and emotion and creating an imaginary world in one’s head. Amazing technology allows ordinary people like me the ability to use tools and software which in the past were reserved only for big budget corporations. Now making music, video games, film and animation is possible for anyone with access to off-the-shelf computers and the internet. These behind-the-scenes posts will explore my experience getting the opportunity to play and build worlds of narrative artwork using these unbelievable tools. I have always thought of Allfield as an umbrella of different, related things – a kind of creative project engine. Programming games-to play and for pre-visualization of artwork and animation-was what I wanted. In my vision I saw cards, animation, and books. Today, there are many more branches of “what could be” in this project. But one thing is for certain-music is a vital component of transporting people to other imaginary places. And even more certain-I knew who had to create it. My brother has been creating a huge catalog of an amazing variety of music for years and years. His music has been downloaded hundreds of thousands of times, and has been used on television in things like National Geographic, Brain Games, CNN and ThinkGeek to name a few. He is an educator and has a diverse set of projects and interests. For more information, his main website is bertjerred.dx.am, jamendo – here, archive.org – here, soundcloud – here, and if you search him on youtube you’ll see a zillion people making crazy videos with his music. While music is not his full time career, it is something he loves to do which shows in all of his work. So I wanted to share a glimpse into an amazing home studio Bert Jerred has been using for over 20 years. During that time he has been honing his approach and his tools. This guy constructed each piece of his studio from various computers and machines, and the wealth of (to me- overwhelming) array of software tools available. Here’s a mix of modern with the kind of keyboard I remember from being a kid. Between computers and microphones and synthesizers are records, guitars, basses, drums, and many other traditional instruments. Occasionally there are things I don’t recognize which could be the inside of a tablet or a time machine, I would not know. I think this is a computer, but I have no idea! Books, instruments, records, and walls covered with pastel-chalk murals. While he definitely has a few kinds of software he is using now, Bert doesn’t seem entrenched in any brand for its own sake, rather he has a fluid and adaptable approach. Fun, functionality, sound, and efficiency seem to be important aspects of his workflow-both in the music and what is happening under the hood of the tech. Sequences of music composed into songs! Bert uses a balance of purely-digital tools and live recordings, until its mixed and the distinctions are seamlessly blended together. Its a one man operation that sounds like a studio full of musicians. Listen to some clips here! Hope you enjoyed this – let me know what you think and please share. 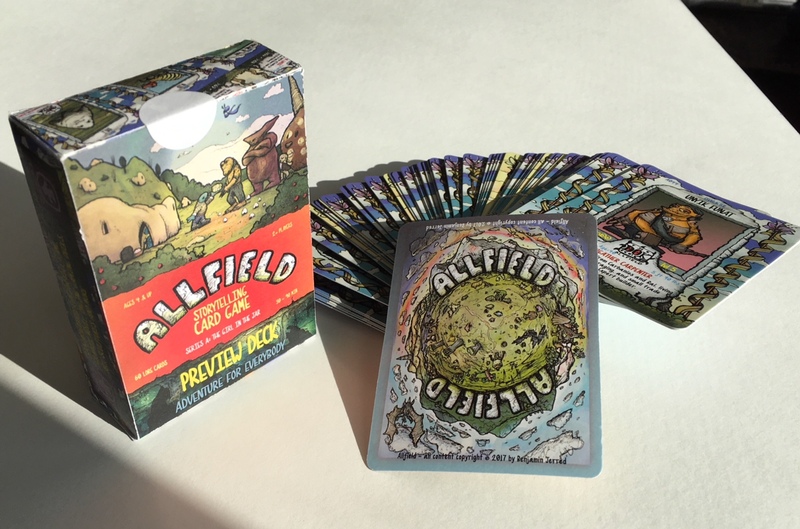 Soon the full graphic novel, the full Allfield card game, and the entire music soundtrack will be available for supporting on Kickstarter.